It is done! 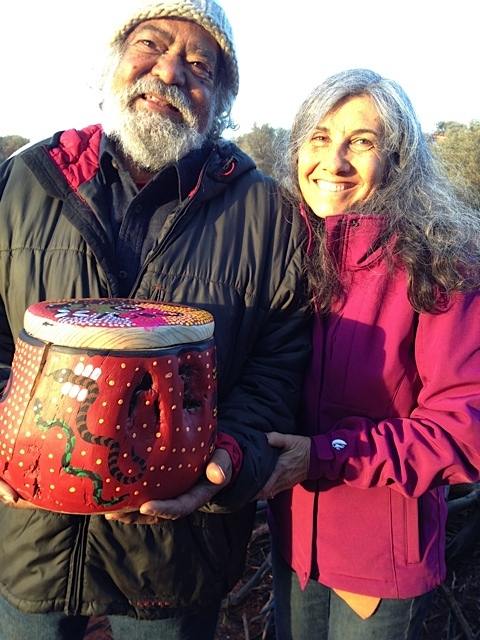 The final Earth Treasure Vase was buried in Australia on the June 2013 full moon by Cynthia and a group of pilgrims. Now, the global mandala is complete and transmitting our most heartfelt prayers, songs and dreams throughout the Earth for her protection and healing. Cynthia shares her account of the journey below. To read more stories and testimonials from the many pilgrims who helped steward the vase, please visit here. Watch In Dreamtime by filmmaker Anthony Carlson, who documented the journey for a film to come. Our journey began in beautiful Sydney. We gathered the first night for a community ETV ceremony and were “welcomed to country” by Aboriginal elder, Auntie Millie Ingram of the Kadagil people. “Welcome to Country” is a traditional custom that we experienced in different forms everywhere we went. An elder representative of the local tribe opens the way to the land and people of that country with love and warmth, and requests permission for us to be there — introducing us to the spirits of the land who are said to then send the news of our presence on, opening the way for continued harmony and blessings to accompany us. For the next three days in Sydney, we attended teachings from His Holiness the Dalai Lama on Bodhicitta, the altruistic aim and selfless desire to realize enlightenment for the benefit of all sentient beings. Arrangements had been made for us to place the ETV on one of the main altars on stage for the teachings. In the presence of thousands of people, it humbly sat there holding its own, absorbing the blessings. Then on the second day, when His Holiness entered the auditorium, he paused in front of our little holy vessel and gave it his personal blessing! 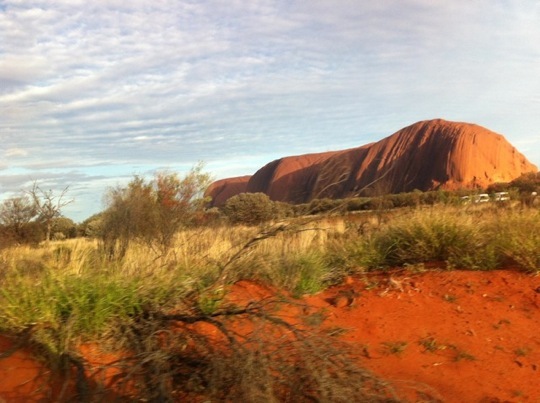 From Sydney we traveled to Uluru (Ayers Rock). Flying in, I was struck by the enormity of this sacred monolith rising up out of the vast central desert — the “copper colored mountain” of Australia, as my beloved dharma brother and our masterful pilgrimage guide, Jeremy Ball, calls Uluru. Uncle Bob Randall and his wife, Barbara, at our camp. Uncle Bob welcomed us to country in the traditional way and invited us to feast on kangaroo tail roasted in a bed of hot coals…a local delicacy! Uncle Bob and Barbara told us stories, sang songs and danced around the campfire until we collapsed into our tents for a good nights’ sleep made for dreaming. Later at Uncle Bob’s home, he blessed the Vase with earth and water from Uluru, inviting members of our group, representing various parts of the world, to add their prayers for the whole Earth. 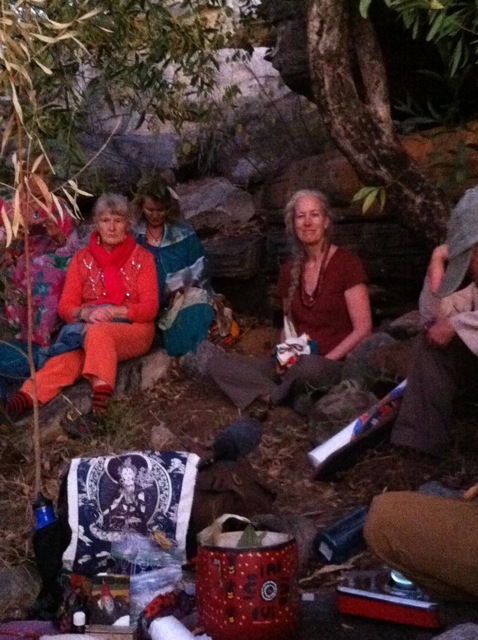 We stayed with Bob and Barbara late into the evening, hearing stories and receiving teachings at their home in Mutijulla, an Aboriginal community much like a Native American reservation located inside the park that tourists are usually not allowed to visit. 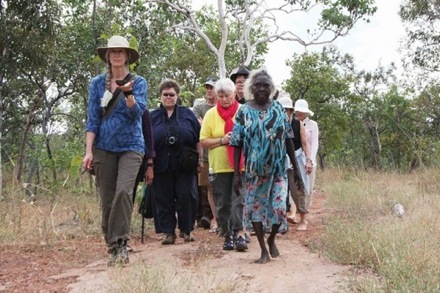 The community there has become increasingly alienated as tourism has taken hold of their sacred land and the Australian government asserts its power over the traditional owners. We were happy to meet members of Bob’s family, guides and artists who joined us. 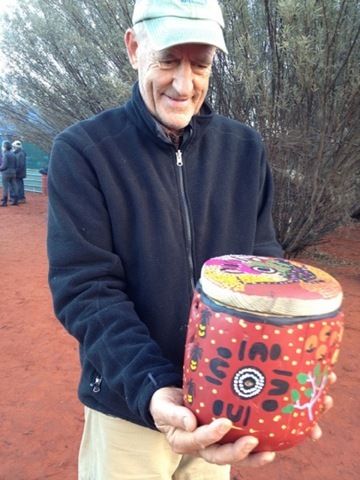 Fellow pilgrim David Bacon had crafted a hollowed out piece of New Mexico pinon to bury the ETV in and sponsored several artists to paint the ETV “casket” that night, resulting in an even more beautiful ETV offering for Australia. Fellow pilgrim, David Bacon, with the “casket” he had carved from pinon, after it had been painted. An auspicious rain fell the next day as we visited another incredibly beautiful site, Kata Tjuta. 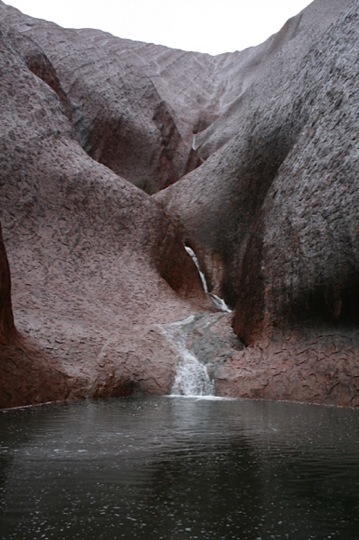 We returned to Uluru to see waterfalls cascading down the side of the rock in braided patterns that filled all the water holes to brimming — a rare sight in the desert. At Uluru, like so much of Australia, every rock crevasse and turn of the path has a dreaming story associated with it and a teaching that is still relevant today. Our group was beginning to get a glimpse of the richness of this ancient land and the great wisdom of its people. Uncle Bob’s transmission of unconditional love opened our hearts and began to flow, expressing itself freely in all our interactions every step of the way. We were falling in love with each other and the land! David took the lead in offering to support several initiatives that Uncle Bob spoke to us about: a weeklong women’s ceremony dedicated to the Seven Sisters that needs to be reclaimed before it is lost, and a sustainable tree planting program on Aboriginal-owned land to provide much needed firewood and food for the Aboriginal community independent of the government system. From Uluru we flew to Darwin, a coastal town in the Northern Territory, linking Australia to Asia and the island cultures of the Southern Pacific. Long ago these lands were connected and this ancient Oneness is still alive today in the songlines of Arnhem Land. 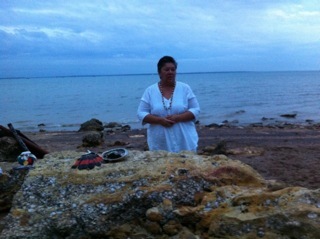 At sunset, we were again welcomed to country by Bilawara Lee from the saltwater people of the Larrakia Nation, who met us on the beach to share her blessing and personally place a specially chosen crystal into the Vase for its further activation. Our group had grown to 18 now to include Jeremy’s trusted team of Ben Manbulloo Emery, Therese Hogan and Leanne Bird. Julian Silburn, a didjeridu master and sound healer also joined us to bring his powerful gift to the ETV. We took the Vase to the water’s edge and bathed it in the ocean’s moisture, offering our prayers for a new story of collective awakening for life on Earth, as tiny phosphorescent creatures danced in the lapping waves at our feet. The solstice was upon us. Larrakia elder, Bilawara, welcomes us to country. That night my dear sisters, Nina and Lynn, kept me awake until 1:30 am and filmmaker Anthony Carlson assisted in arranging the technology for the live global call and ETV meditation organized by the Shift Network and Gaiafield Project. I was thrilled to experience the presence of hundreds of friends on the path of global healing joining us online to activate the ETV mandala as the Australia vase was in the final stages of gathering energy for its completion! I felt a powerful convergence as we meditated together across space and time! If you’d like to listen to a recording of the call go here. Our group received such spiritual support from this extended family that at 3 am, when the call was finished, we jumped up and down, holding hands and beaming with excitement for the final chapter of our journey — burying the Vase. The next morning, with the blessing of HH Dalai Lama, Uncle Bob, Millie, Bilawara, and everyone all over the world who participated in the solstice meditation, our group piled into our fully equipped, state-of-the-art 4WD vehicles and drove to a small station half way to Kakadu where we met an elder of the Jawoyn-Buyhmi people named Margaret Katherine. She and her “mob” greeted us and after sharing a bit about our purpose, a grinning Aunty Margaret piled into one of the vehicles to come along for the rest of the journey! Margaret’s infectious joy and loving spirit embraced us all and her presence was a great blessing and true gift. She cackled and laughed and told incredible stories around the fire at night. She informed us that we would be given “skin names” which identifies us as family with her and her mob (the Jawoyn people) and clarifies all our relations. That first night, she dreamed of my teacher, Charok Rinpoche, from whom the treasure vases had come so long ago. She welcomed us so fully, so openly, and so happily that by the end, we were deeply bonded to her and her land through our skin and in our deepest hearts. 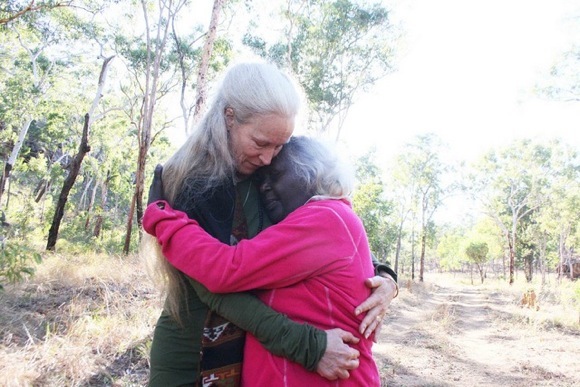 From the moment they met, our Aunty M and our fellow pilgrim, Lynn Augstein, had a special connection. Little did we know what a formidable woman she is, serving as the primary consultant on a major archeological dig in the area that is revealing new information about that ancient land. For more on Margaret Katherine, visit here. We visited a billabong on the solstice where Julian, Therese and her colleague, Michael, played a beautiful musical offering into the Vase. 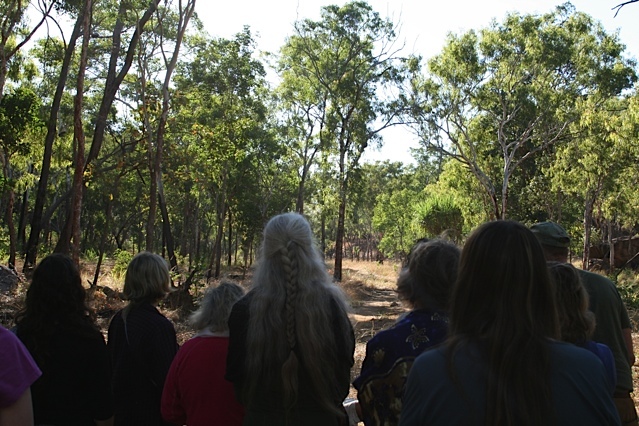 Later, Aunty Margaret organized us into a procession led by drum and didjeridu, she and I following side-by-side with Vase and bell in hand and the group behind us for a walking meditation (at her slow, barefoot pace)…the sound of the bell ringing out into the landscape. At the rock-painting site we walked to, Julian played the didge to the ancestors and performed a healing ritual that took me to the edge of the universe and back. 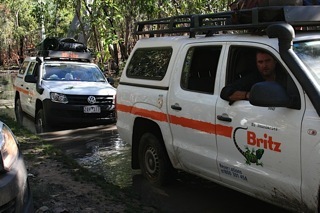 We had come into close proximity to the uranium mine at the center of Kakadu. In the land settlement between the Aboriginal owners and the Australian government, which resulted in the protection of Kakadu as a park, a chunk of land was held aside for uranium mining. The fallout from this mine and the larger issue of land rights, along with continued oppression is an ongoing struggle for the Aboriginal people yet to be resolved. The excellent film, Our Generation, tells this story. Tuning in to the land as we were, our group became acutely aware of the effects of this mine and could feel the distress in the land all around us. Jeremy had dreamed of a place to bury the Vase he thought was nearby. We were feeling our way there when Aunty Margaret sat me down to discuss our plans. “You are welcome to go there, honey, if that is the place you feel you must take “your teacher,” but it’s right in the flood plain and may not be the best place. I have some land that would be very good. I’d like to take you there. It is a place where “your teacher” will be very safe and protected for all time.” As we listened to her describe her land, Jeremy saw clearly that this was the place of his dreams. That night we did another ceremony with the Vase dedicated to the suffering and oppression of the people and distress of that land. We knew it was vitally important to have witnessed this suffering personally so that our prayers for the vase would carry this knowledge and more powerfully assist in bringing balance back to the land in all the ways that are called for. The next morning we rose at dawn with strong motivation to drive to Aunty Margaret’s land and fulfill our mission to bury the Vase on the full moon that night. Galvanized by our higher purpose and the clear direction provided by Margaret, we traveled across country and made our way towards the sacred Aboriginal land we could never enter without Margaret’s permission. She informed us the road was very bumpy and bad for us “white fellas”…and she meant it. The 4WD came in handy as the long road turned to dirt, and then just a track in the forest. One vehicle got stuck in the mud crossing an overflowing spring. Deeper and deeper she led us into that magical landscape. Several times in my life I felt I have entered a timeless realm behind the veil and this was one of them. We traveled through the dappled light and shadows of the gum trees, between gorgeous rock walls on either side of a peaceful canyon with a river running through it, and eventually came to a perfect campsite where we stopped. Margaret walked on, pointing to where the road continued, and called out to her ancestors and the spirits of the place, asking that the way be opened to us and the Vase welcomed to its home. After this formality, with Ben Manbulloo at the wheel, she escorted Jeremy and me to find the actual site to bury the Vase — on the lookout the whole way for the guardian palms who protect the area like sentinels. Eventually we realized the entire area was IT and anywhere would be perfect! Asking to be guided, Jeremy and I walked up into the rocks to find a good home for the Vase. We could feel the local spirits, protectors, devas and ancestors watching closely and cheering us on. We had arrived. As the sun drew low, Jeremy went back to tell Ben to bring the group. Margaret hunkered down to hold space and I was left alone to find the spot. I was drawn to a rock overhang with a small cave and just enough dirt to dig a very nice hole for the Vase. A slender tree grew up amongst the rock in front and many large boulders provided ample seating for our group’s final ceremony. 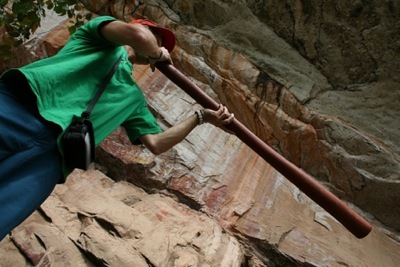 Jeremy, whose life purpose is devoted to Mother Earth, took one look at the site, nodded, “Yes!” and began to prepare the land to receive the Vase — carefully digging and building a rock wall to fully enclose the Vase at the back of the cave and gathering rocks to surround the Vase in front after it was buried, sealing it in the rock for all time. I made an altar and began to meditate. 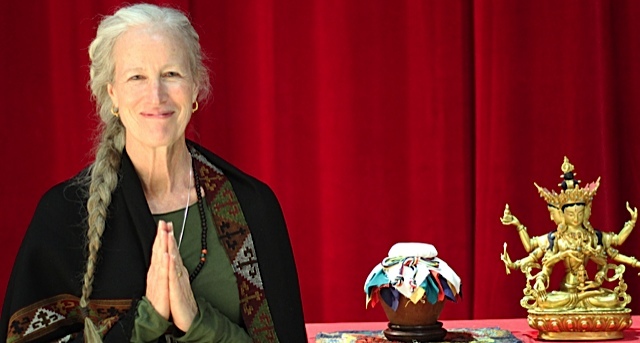 Holding the ETV, I spontaneously touched the ground beside me and realized that like the Buddha under the Bodhi tree, I was summoning the Earth to witness all of our prayers culminating at this great moment — 23 years of practice that had become my lifework. I could feel the entire global community in the Vase — all of our intentions, our deep love and caring, and the responsibility we have collectively accepted as part of the interconnected web of life at this time — and how we are awakening to become holy vessels ourselves. Tears streamed down my face as I felt the impact of having arrived at this moment and the Great Perfection that has accompanied us every step of the way. Jeremy gathered yellow flowers that we reverently arranged in front of the cave. The group arrived. David brought the beautiful casket and beeswax to seal the Vase along with a small stove to melt it. The final meditation commenced and the Vase was passed around for last offerings as we called upon Tara-Gaia to assist us in the completion. Julian’s didjeridu and amazing overtone chanting added another dimension that carried us on. We sealed the Vase with the beeswax and tied the silks into place, but alas, with all the overflow offerings, the casket would not close! To fix it, David worked to burn and char the inside of the wooden lid with fire and carve it with a knife so that it would eventually close. With the full moon rising over the trees, the group chanted on and on for an extended period. We had been given the opportunity to meet the moment even more fully and enter that sacred ceremonial timeless state where anything can happen and miracles are born. 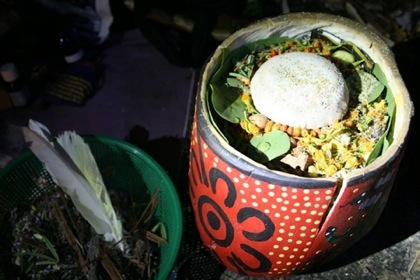 I had brought Earth, herbs and medicines from every ETV location and as our chanting built up a powerful energy, I sprinkled these into the container around the Vase with David working away and the group chanting more and more strongly. A potent alchemical mixture was being cooked up that night! Suddenly we noticed that the campfire Margaret had lit, to keep her and Ben company as they held space below, had taken off and was burning through the underbrush out of control. “Is everything ok down there?” we yelled. “Yep” was Ben’s reply. Again, “Is the fire really under control?” “Yep,” again was the answer. We had seen that burning unwanted undergrowth was a common practice in those parts: clearly the people knew how to manage the land in this way. So we continued, realizing that Margaret was intentionally doing her part to clear away the obstacles and work her own magic into the alchemy of the moment. She was keeping those “cheeky” buffalos away from us too! We howled and yelped and were answered by wild dingoes across the valley. Surrounded by fire, with the brilliant moon overhead, I poured water gathered from the Rio Grande River to cool the heat inside the casket’s lid — connecting the last Vase to the first…buried so long ago at the source of the Rio Grande. Our little Vase was finally sealed upon sealed upon sealed inside the casket — never to be disturbed — and to the heartbeat of a drum and Julian’s evocative Native American flute, I placed it in its cave and offered three full prostrations, my skin and that Earth now One. 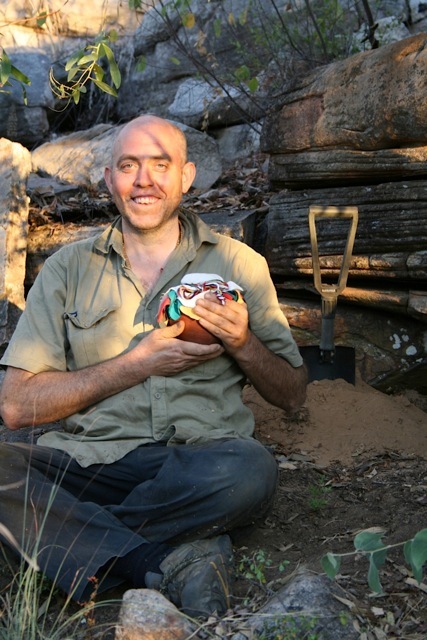 In partnership, Jeremy came forward to cover the Vase with dirt then rock, every stone finding its rightful place with the encouragement of the group, sealing our treasure inside. Bidding farewell and covering our tracks, we quietly made our way down the hill to Margaret, aware that the fire had indeed stayed low and calm and successfully burned off and away. She laughed and hugged each of us, saying that she would protect that place forever and offer her prayers every time she came that way, adding that the only folks to know would be her husband and sons. Back at camp we could not sleep, quickened by the altered state we were in and the beauty of the moon and stars shining so bright in that exquisite place. Dreamtime memories were reawakening and Julian played his didjeridu throughout the night for everyone to receive a sound healing as we soaked up every last drop before reluctantly departing the next morning. It is clear now that with Margaret’s ongoing prayers and protection, what we accomplished that night will live on in the dreaming stories of her family and be passed from generation to generation. Our Jayown family, the ancestors of this most ancient land and all future generations have joined together as One for the benefit of all, in a timeless moment of healing for the whole Earth. As one story draws to a close, a new story begins. The ETV global mandala has been made whole and the divine matrix has been activated through our loving intentions and careful offerings. Australia, that most ancient land with its incredible wise culture, has been honored, included and brought into right relationship with the whole of the Earth. The light emanating from the Vase in that protected land behind the veil is rippling out endlessly into a new time…. ….a time of connection and collaboration, of Unity and Oneness in the collective awareness of our shared responsibility to accept the privilege along with the whole of creation to participate with great joy in one thousand years of healing. Thank you for the opportunity to live this legend, tell this tale, and for listening. Your presence and participation in realizing the promise of this story has brought immeasurable benefit to the Earth and all beings. in my envelope of mysteries it hums. we put a broken age to rest. one thousand years of healing! of the Great Magic we move within. for a thousand years of healing. Julian Silburn calling in one thousand years of healing with his didjeridu. It is really good to see You. Be the light of Love that will remain with us today and always. As being given that right by The Tjukurrpa. The Australian vase was originally given to Pamela Meidell, an anti-nuclear activist and founder of the Atomic Mirror, who stewarded it for many years. Pamela carried the vase to several gatherings of international import, including Abolition 2000 and the Nuclear Nonproliferation Treaty Review Conference at the United Nations in May 2000. 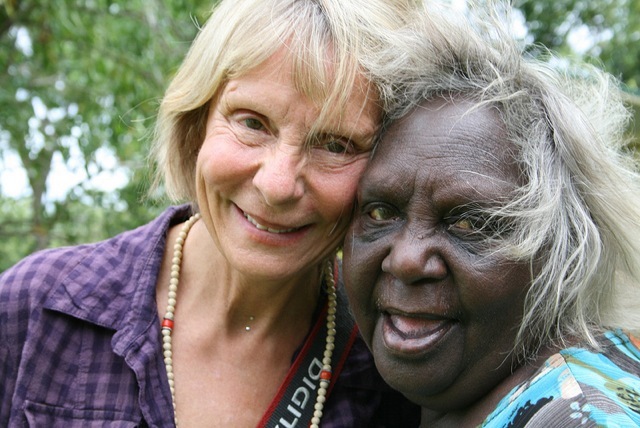 She sought ways to give the vase to the Mirrar people and their land in Kakadu National Park, a UNESCO World Heritage Site. 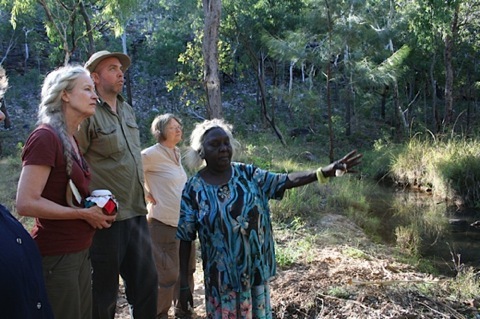 The Mirrar have struggled against the destruction of their land, sacred sites, the dream tracks that traverse the land and their traditional ways due to uranium mining. After 9 years, the Earth Treasure Vase was returned to Alliance for the Earth to be accomplished. We offer our deep gratitude to Pamela for her stewardship and for her many good efforts to find the right person and situation to entrust the vase to. We have discovered from experience that each of these holy vessels have a life of their own and that the way forward opens in divine timing, not our own. This entry was posted on Friday, August 30th, 2013 at 11:00 am	and is filed under Burials. You can follow any responses to this entry through the RSS 2.0 feed. You can leave a response, or trackback from your own site. In the future, it is possible that I may go to Australia. It may be a year or two, but the possibility exists. If this Earth Vessel still needs a way to get to Australia when that time comes, let me know who I will need to contact to make it happen. Also, please let me know if it goes by some other means. Hi, Dianne. Thank you for your offer. Shortly after you wrote, we met Uncle Bob Randall, custodial elder of Uluru (Ayers Rock). We will be journeying to Australia in May 2011 to bring him the Earth Treasure Vase, which will be buried in ceremony by Uncle Bob and his people. 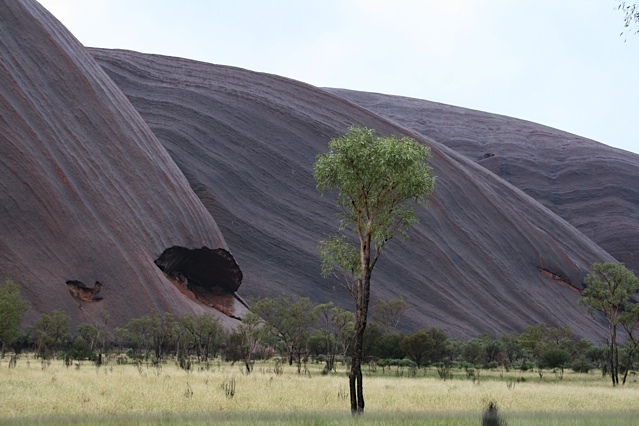 If your daughter is interested in joining the pilgrimage to Uluru, please contact us at info@earthtreasurevase.org. For more information about Uncle Bob, click here. Thank you for your comment and for your invitation. 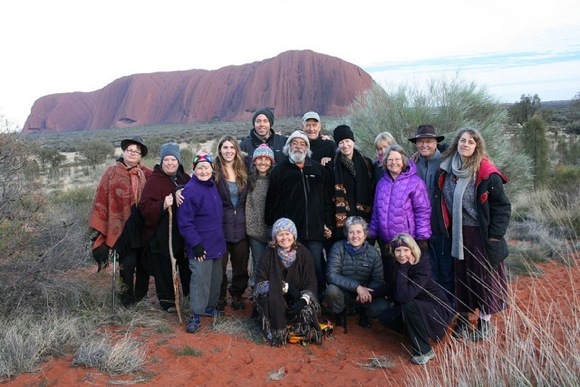 We do not wish to be exclusive in any way and if you would like to organize a gathering in Sydney, prior to our journey to Uluru, we would greatly appreciate the possibility of widening the circle and welcoming the prayers and offerings of your community. A word about the intent of the Earth Treasure Vase Project in general and the Australia Earth Treasure Vase specifically: Cynthia has waited and listened for the best way forward to emerge for two decades. As you can see, another steward stepped forward some years ago, but that way ultimately did not come to pass. At the heart of the practice and tradition is the honoring of indigenous wisdom and the First Peoples as the original stewards of the Earth. 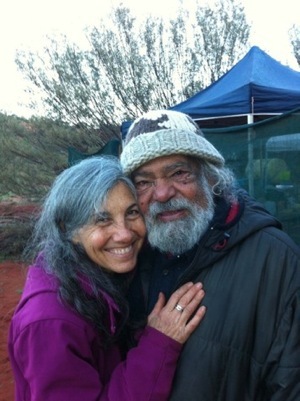 When Uncle Bob Randall, the traditional custodial elder of Uluru, stepped forward in the late fall of 2010, we could only be grateful that a path, where there had been none, had opened so miraculously and wonderfully. Again, it is not in any way that we intend to be exclusive. We welcome the opportunity to bring the vase to your community should that be something you are interested in. Last night I went to the Congo Treasure Vase Ceremony and was impressed by the purity of the Buddhist/Shamnistic impetus for the end of suffering of all sentient beings. 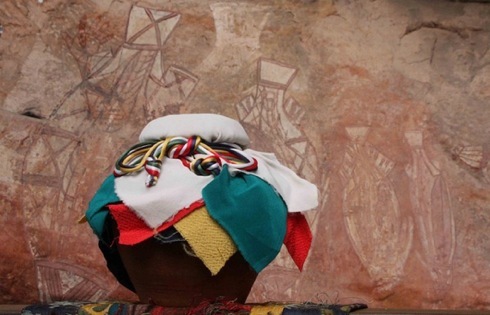 I was particularly impressed by the South African movie about the white lions of light and the Bushman shaman blessing pf the ” South African Treasure Vase”. I wondered if a vase had been imbedded in Australia? Again, I was delighted to see that Bob Randall, an Aboriginal elder, shaman and author participated…Perfect! The involvement of two of the most ancient cultures on Earth i.e. Aborigines and Bushman and thier elders and medicine(s) can only bring the best of blessings to all. Thank you, Bob, for your kind words and participation. We have yet to plant a vase in Australia and are currently listening and watching for the path to open before us. It is our intention to bury the remaining Earth Treasure Vases before 12.21.12. Hope you’ll continue to join us in our prayers. Blessings to you. Hi 🙂 can I start by saying thank-you for listening to your heart and following your inner voice and manifesting such a wonderful project, with such wonderful benefits to so many of gia’s people, plants and animals. In 1991, whilst living in London I heard a kind of zeitgeisty rumor of an important gathering at Uluru for new year 2000. After following what was then a series of festivals, steering me to important bits of jigsaw puzzle(people) , I stumbled on a wonderful Aboriginal story of a baby that was lain to sleep on the edge of a corroboree dance floor in the Pleiades ( called the seven sisters in indigenous Aboriginal folklore). Orion the mighty hunter ( also a warrior holding spear in indigenous stories) is in love with one of the sisters, and is chasing her across the sky every night . The sisters dance to protect the girl from this unrequited love, and somehow the baby is bumped out of the protection of the corroboree and falls to earth at Gosse’s Bluff, an ancient meteor impact crater in Central Australia near Uluru. an anti-nuclear movement at that time. We saw the new year in at a salt lake near Alice and quite soon after I met a sakya lama at a teaching he was giving in Alice springs. He introduced me to a nun living in Alice, Ani Konchog droling( Miranda Coates). Ani Miranda started a centre there and we practiced meditation on wed morn, tsog on thursday and nundro on saturday , accumulating merit and clearing obstacles for peace etc. Later in the year we did a retreat at Uluru which really was powerful and shifted a great deal of negative prospects to some very positive initiatives. After 18 months the gyuto monks came to stay at our little centre and spent 2 weeks doing a sand mandala of chakrasahmvara which really completed my leg of that journey. I passed the baton on at that time and came home to return to my samsaric exsistence for a long period and am now living on the mornington peninsula in contact with a friend who is currently getting a project up and running to tackle youth suicide in and around Ahrnem land. I write to praise your and all the people involved in your project’s efforts to bring some healing to this part of Australia. I view it as a Beyul ( hidden land) . I believe there are many places in central Australia of extraordinary spiritual power, and your vase project is entirely appropriate and needed in this part of our wonderful world. There is enormous suffering in indigenous communities as a result of the destructive effects of mining and the negative aspects of western culture including alcohol and drugs. Reverend Dr Gondarra appears to be an entirely appropriate and wise elder to decide on the location of the vase and I am entirely supportive of his, and his circle of elders to decide the appropriate place for the vases final resting place. Thank you so much for writing. I was very moved by your story, your vision and your understanding of what we are doing with the Earth Treasure Vase in Australia. Thank you for sharing. The pilgrimage that was planned for last December was postponed and we are now coming in June. The Reverened Gondarra had suggested we bring the Vase to Uluru for a gathering of elders he was planning to organize for June which is why we changed the timing of our journey. Unfortunately that gathering has not materialized. We hope we may meet Reverend Gondarra in Darwin in any case. Fortunately, coming in June allows us to attend teachings from HH Dalai Lama in Sydney, then meet with Bob Randall at Uluru before travelling with the vase to Kakadu region. Perhaps you might like to join us? Certainly your prayers and spiritual support while we travel would be very welcome. I am interested in your comment about Arnhem Land being a “beyul”. I am familiar with the notion and have been to a few of these kinds of places myself. Is there any place in that area in particular that you might direct us to? I have a sense that after 20+ years of taking these little Earth Treasure Vases all over the planet, that we are to learn something from being in Australia in connection to the songlines that will inform the whole planetary network of ley lines and ETV locations we have been offering our prayers into and for all this time…..I do not exactly know what that is yet but am open to learning when we are there. Any insight you might have about this would be welcome. 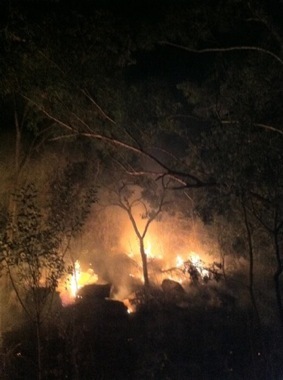 I am also very aware of the suffering the Aboriginal communities have gone through in Australia. One of the original motivations around this whole practice has been an attempt to bring healing to places that have been damaged from mining, especially in relation to the production of nuclear weapons and the radioactive waste that effects indigenous communities. So this is also a part of the prayer we are carrying with this particular vessel. Many blessings on your heartfelt work and practice there. Inaluxe: Thaks, things are going great. Almost back to nraoml!Hand embroidered sounds lovely.There s just something about handmade and good memories.MMMC: Tiny is up and running. Can t get enough kisses ;)Takk, Butterfly!Thank you Bubbles.Enjoy your sunday! Love , Lena.